The work opens with a Larghetto which has the violins sighing in a serious, stately fashion; then it moves to a Vivace with a youthful feel as the melody is passed between the instruments in a lively way; the largo third movement is again stately and the final allegro is familiar thanks to Handel lifting material from an aria in ‘Imeneo’. The small group of excellent musicians playing this piece included Kenin McKay & Natalie Wong, violin; Laurence Schaufele, viola; cellist Andrew Ascenzo, Shannon Paterson, bass with Potvin playing continuo. One expects a high standard of musicianship at Musikay concerts and tonight was no exception; while each is a talented musician it is the way they blend that makes them so outstanding. 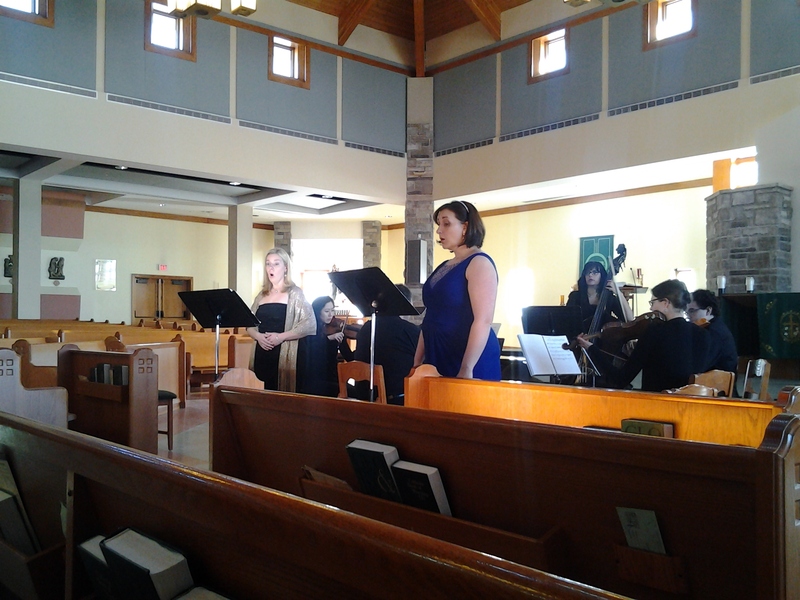 Soprano Catherine Arcand-Pinette and alto Erika Bailey joined the ensemble for the Stabat Mater by Giovanni Battista Pergolesi. This work was commissioned by a religious brotherhood to replace an earlier version by Scarlatti which was becoming dated. It is a musical setting for a thirteenth century poem written as a meditation on the suffering of Mary as she witnesses her son’s crucifixion. Pergolesi gives it an immediacy by presenting the text sung by soloists rather than a chorus. Each of the twelve sections are sung either as soli or duets and there is a lot of variation in the music even though the overall tone is one of pain and sorrow, there are even some rather lively sections and the final amen is thunderous. Unfortunately, Pergolesi died very young, [at 26], of tuberculosis and this gorgeous Stabat Mater is his last work. It seemed to follow naturally from the previous Handel work as though it was a continuation and one wonders what he would have written given many more years—that thought brings regret and sorrow.